It has so often happened, as we have traveled over all these many years, that the most memorable places we have visited are those we merely happened upon. That was certainly true as we traveled to England last summer. While planning our trip abroad, our son asked me, “Mom, is there anything special you want to see?” I was ready with the answer, the answer I would have had to that question since reading “Salisbury”, by Edmund Rutherford many years ago. I wanted to see Stonehenge. And we did, and I loved it. But…then our son told us that he wanted to stop at a place along the way. He had rented a car for the trip from London to Stonehenge, and this place was along the route we would be taking. And there it was…that special place along the road, the one I never imagined, the one I loved more than anything else I saw on the entire trip. I loved it for so many different reasons, and I feel so fortunate to have had the opportunity to spend time walking the grounds of, and feeling the mystique of, the ruins of Glastonbury Abbey. Glastonbury Abbey as it appears in the 21st century. Legend tells us that the original church in Glastonbury was built in the first century by Joseph of Arimathea, on a journey he made to the area with Jesus, who was a child at the time. Legend also tells us that it was here at Glastonbury that Joseph buried the Holy Grail, the cup used by Jesus at the Last Supper. You may remember Joseph as the man who took the responsibility for burying Jesus following His crucifixion. There is no historical evidence to support these claims, and the mystery of the Grail continues to this day. Archaeologists have found evidence, however, that the first church, of wattle and daub, establishing the abbey at Glastonbury may have been built as early as the second century. 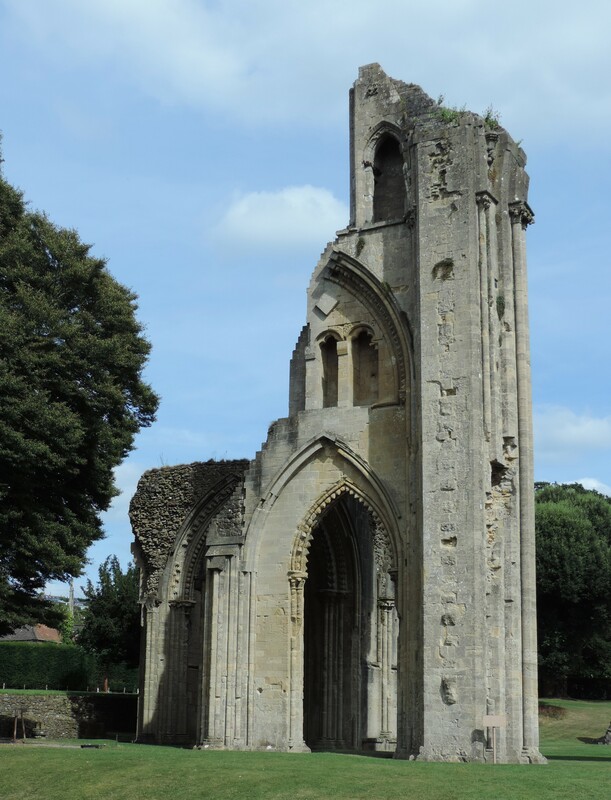 That it is the burial place of King Arthur and Lady Guinevere is another legend associated with Glastonbury Abbey. 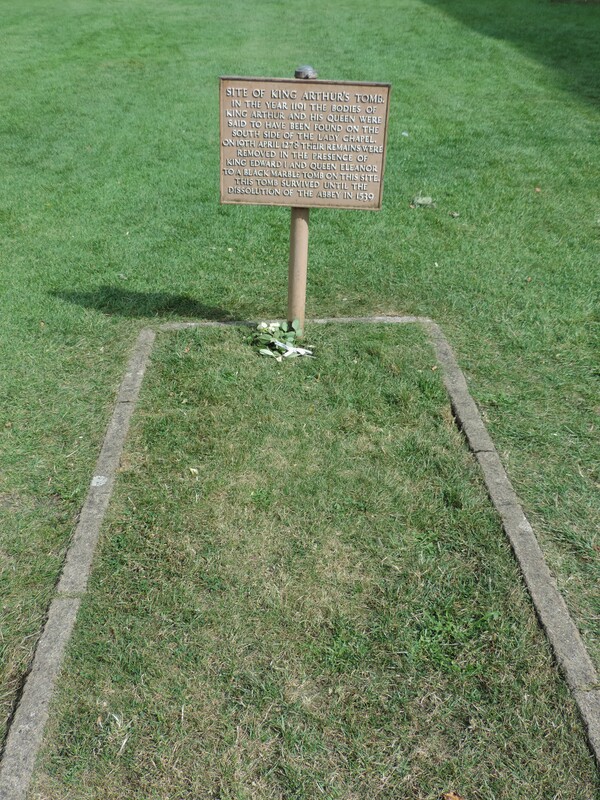 There are several versions of how the graves were discovered, but we do know that when the bones believed to be that of the King and Queen were placed in a new grave in 1191, pilgrimages to Glastonbury rose, bringing much needed “tourist” money to the abbey. In 1278, the bones of King Arthur and Lady Guinevere were moved once again to a new grave within a rebuilt abbey. Here are some facts we do know about Glastonbury Abbey, and its place in English history. The first stone church at Glastonbury was built by the Saxon king, Ine of Wessex in 712. It was enlarged in the eighth century, and then again in the tenth. The stone to build the abbey came from its own quarry. By 1086, Glastonbury Abbey was recorded as the wealthiest monastery in all of England. In 1184, a fire destroyed most of the monastery, leaving only the bell tower and one small room. The abbey was restored with financial assistance from the crown under King Henry II. It was during this reconstruction that the grave of King Arthur and Queen Guinevere are said to have been discovered. In 1539, Glastonbury Abbey was closed by Henry VIII as part of his Dissolution of the Monasteries. The property was stripped of its wealth and its treasures, most of the proceeds going to fund the military campaigns of King Henry VIII in the 1540’s. He sold the property itself, after which much of its stone and ornate stoneworks were taken away to build and adorn other buildings. At one time the abbey even became a quarry. After years of decline and destruction, the abbey came under the protection of the Ancient Monuments Protection Act of 1882. 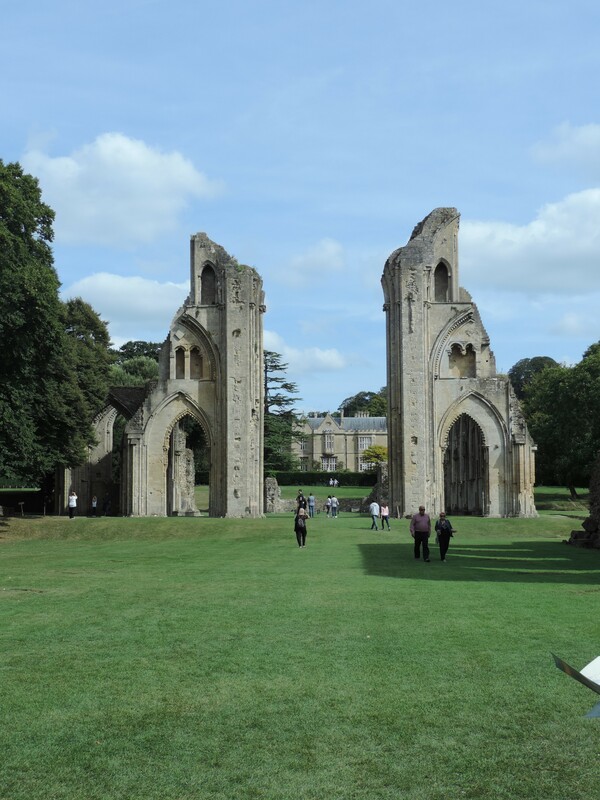 Archaeological studies were conducted, historical research ensued, and Glastonbury Abbey was opened to the public as a place to visit, a place for quiet reflection, a place of renewal. One of the most beautiful places on the Glastonbury grounds is the remains of the Lady Chapel. A Lady Chapel is the largest side chapel of a cathedral, and is built in an easterly direction from the high altar of the cathedral. For me, the Lady Chapel was not only the most beautiful, but the most inspiring and sacred place on the grounds. I was most taken by the resilience of nature…that nature can surmount all odds, and burst forth to change our perspectives, our ability to hope and dream, and in so doing enrich our lives. Out of all the ruin, out of all the destruction, came wildflowers and grasses. They were the highlight of my experience, and they were that one thing about the abbey that still stays with me, making Glastonbury Abbey one of my most treasured experiences. where nature tells us there is much for which to hope. The most well preserved building of the abbey is the Abbott’s Kitchen. Built between 1334 and 1342, it is an octagonal building with its massive chimney still intact. Inside the kitchen are four fireplaces. The Kitchen has been set up to display a feeling of how the abbott lived within the confines of the monastery. One of the four fireplaces inside the kitchen…. What it might have been like inside the kitchen in medieval times. Visiting Glastonbury Abbey in Somerset was one part of our experience of a lifetime, traveling England. While traveling in England, I purchased several cookbooks…it is what I do anywhere I go! I love making recipes from other places, and I especially enjoy experiencing the tastes of many years ago. One of the cookbooks I purchased was “The Medieval Cookbook: 50 Authentic Recipes, Translated and Adapted for the Modern Cook”, by Maggie Black, and published by The British Museum Press. I can imagine the cooks in the Abbot’s Kitchen cooking up this dish for the abbot. Here is my version of this recipe. I hope you enjoy it, and maybe think about Old England, and what it might have been like at Glastonbury Abbey. Enjoy! A fairly simple recipe to bring to life the food of many years ago. Cook the rice in 2 pints of the chicken stock. Cool. Cook the ground meat in another pan. In the remaining stock, steep the ground almonds for about 15 minutes. Strain the almond milk into the cooled rice, and bring to a simmer. Stir in the cooked ground meat and the lard, stirring to warm everything together. Season the dish as you cook it. 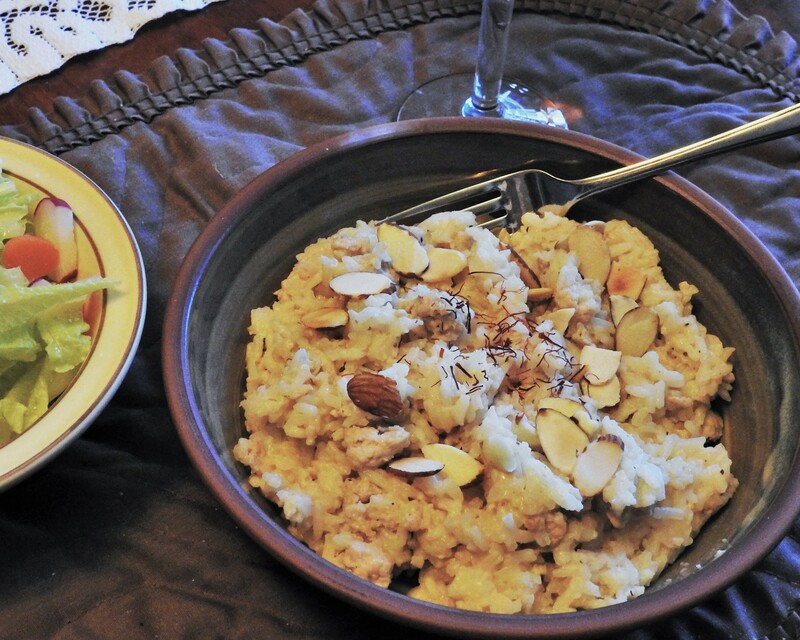 Serve the chicken and rice in bowls with a sprinkle of slivered almonds and the sugar or saffron threads.